Take a black-and-white trip back in time to Red Square, the Bolshoi Theater and old-timey Moscow streets. 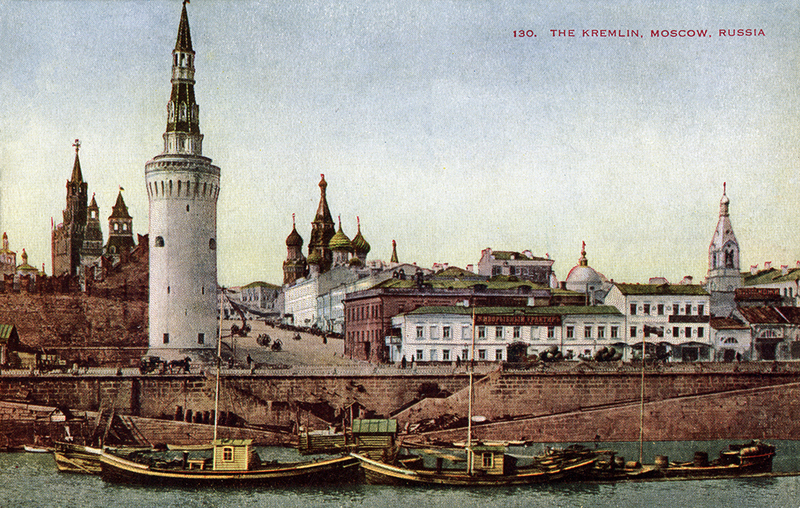 A view of the Kremlin walls and the Moskva River embankment, including the first and the second Nameless Towers which were built in the 1480s and are more than 30 meters tall. Nikolskaya is one of Moscow's oldest streets. It was named after its most distinctive landmark – the ancient St. Nicholas Monastery. At the end of the 15th century, before Red Square appeared on the map, the street had led to Nikolsky Gate in the eponymous Kremlin tower. A view of Kutuzovsky Prospect and the Triumphal Arch. Architect Joseph Bové created the Triumphal Arc in memory of Russia's victory in the war with Napoleon in 1812. Initially, this monument was located in Tverskaya Zastava Square and was one of many memorial arches on the Russian army’s route home from Europe. At the direction of the Soviet government, the arch was dismantled in 1936. It was not until 32 years later that an exact replica of it was installed in Kutuzovsky Prospect. A view of Kamergersky and Gazetny alleys from Kuznetsky Bridge. The alley has had several names over the years. At the end of the 19th century, it obtained its present-day name, Kamergersky, because many of its residents were state officials bearing the court title of gentlemen-in-waiting, or kamergers in Russian. At present, Kamergersky Alley is a pedestrian street with fancy bars, restaurants and shops. "At sunset, high above the town, on the stone roof of one of the most beautiful buildings in Moscow, built about a century and a half ago, stood two figures – Woland and Azazello. They were invisible from the street below ... although they could see almost to the limits of the city." This is how the Russian writer Mikhail Bulgakov mentions the Pashkov House in his novel "The Master and Margarita" (translation by Michael Glenny), referring to the landmark which became one of the Muscovites’ favorite attractions soon after its construction in 1786. Today, the building belongs to the Russian State Library and can be visited on a guided tour. In the 17th–19th centuries, Kuznetsky Most Street was inhabited by high-profile aristocratic families. Before the revolution of 1917, Kuznetsky Bridge Street was Moscow's main shopping street, "a sanctuary of luxury and style" in the eyes of contemporaries. In keeping with tradition, Kuznetsky Most now features a variety of clothing boutiques, bookstores and restaurants, in addition to all its landmarks from bygone eras. The history of Teatralnaya (Theater) Square began in 1812, when Moscow had to survive a devastating fire during the war against Napoleon. During the post-war restoration period, the predecessor of the modern Bolshoi Theater was built in the square. At that time, it was called the Petrovsky Theater. A major part of the square was not open to most Muscovites until 1911, as it was used by the military as a drill field. Apart from the Bolshoi Theater, the present-day Teatralnaya Square features the Maly and Molodezhny theaters, the TsUM department store, the historic building of Hotel Metropol and the Bolshoi Theater rehearsal facility, which is connected to the main building by an underground passage. Before 1921, Moscow's main department store, GUM, was called the Upper Shopping Stalls. It used to be Europe's largest indoor shopping street with its own power station, bank offices, telegraph and even an artesian well. The fancy façade of the shopping mall overlooked Red Square, and inside, it resembled an immense oriental bazaar. During Soviet times, GUM suffered a few periods of downtime, and Stalin considered demolishing the building on two occasions. In spite of its tumultuous history, Muscovites view this tiny trade city inside a city as a symbol of la dolce vita. They often come here just to stroll around or grab an ice cream, not only for shopping. Moscow State University Library in Mokhovaya Street was built in 1897–1901. Its round reading hall was designed after that of the British Museum in London. Today, the students of the Faculty of Journalism of Moscow State University study here. The Sanduny banya were named after actor Sila Sandunov (1756–1820), who founded them in 1808. In the late 19th – early 20th century, the saunas, nicknamed "Sanduny," were turned into a luxurious spa facility frequented by wealthy officials and celebrities. The Russian film director Sergei Eisenstein shot scenes from his movies Battleship Potemkin (1925) and Alexander Nevsky (1938) in the swimming pool of the Sanduny banya, while the American director Walter Hill used it as a setting for a scene in his Red Heat (1988), which starred Arnold Schwarzenegger.